Good morning, here are Sunday’s Patriots news 7-31 and notes on what’s happening around the AFC East. Do you think that people in these parts … in other words Patriots fans, missed football? After having 12,393 fans show up for the opening day of training camp, the first padded practice of 2016 had the incredible number of 21,781 fans packing the Gillette practice fields, the hill on the side and the tiers of the stadium overlooking the entire process. Saturday was as packed a practice as I’ve ever seen in the past nine years. For those of us who have been fortunate enough to sit in on Bill Belichick’s press conferences the past few years, the one thing that stands out is that there is nothing wasted. And everything has a meaning. That means if you’re a member of the press, you better do your homework and come prepared. No one wants to be “that guy”. The one who asks a dumb question and gets the blank stare or the sarcastic, monotone of the coach when he’s annoyed. We’ve all seen it and it isn’t a pretty sight. 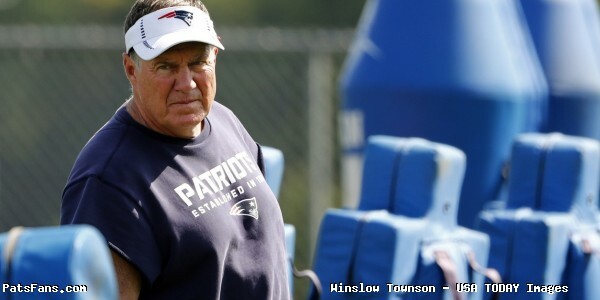 So when training camp began on Thursday, Belichick’s comments were straightforward and to the point. He said the team’s #1 focus was to prepare Jimmy Garoppolo to start the season. But more importantly, he stated that when he returned to the team during Week 5, Tom Brady was going to be the starting QB. Right there Belichick put out the QB controversy fires out with a quick statement. Regardless of how Jimmy G. plays in the first month, the position belongs to Brady. Belichick has seen first-hand both in Cleveland and here how distracting a QB controversy can be. And if you’re a media member, you “shoulda” been paying attention. A media member asked Belichick on Friday exactly what he unequivocally stated on Thursday. ““Look, I told you what’s going to happen,” growled Belichick. The warning signs were there but the member persisted “So there’s no chance?” and that when Belichick mumbled “Jesus Christ” under his breath but audible on the microphones. Whether you love his ways or hate them, that is how he rolls. And his “four Super Bowl pelts on the wall” give him plenty of ammo. Sometimes it is better not to poke the bear. Patriots left tackle Nate Solder tore his biceps and was lost for the season after the Dallas game last October. He’s healthy and is back to work this season which is very good news for the Patriots. 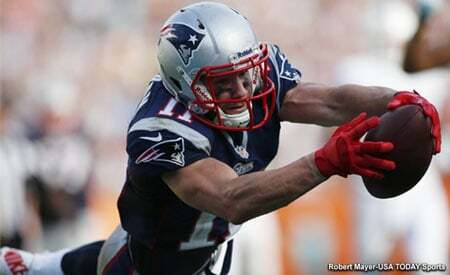 But his return is just secondary on Solder’s mind. His son Hudson is just a year old and was diagnosed with cancerous tumors on both his kidneys just after he was born last July. Solder himself battled testicular cancer just before his son was born. But now both of them are getting healthy and the two along with his wife Lexi were playing on the field after the Patriots first practice. It put everything into perspective for the Pats starting left tackle. “Oh man, I’m so excited to be out here. Been a while since I’ve been able to play, so I’m so excited about that. My son is doing awesome. Treatment is going well and we’ve been getting so many prayers and messages from so many people that we just appreciate it so, so much”, he said in an interview with Fox 25’s Tom Leyden. Practices and parking are free during training camp but as a word to the wise. Arrive early. Parking is in the P6 or P8 parking lots. It is first-come, first served and the crowds get bigger every year. Saturday’s crowd was the largest I’ve witnessed in the past nine years. 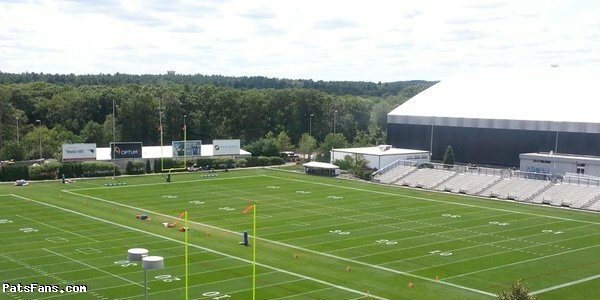 7:00 – 9:00 p.m. In-stadium practice, open to Season Ticket Holders and Foxboro residents only. Remember the schedule is subject to change and that in the case of inclement weather, should the team move inside the practice bubble, fans are not allowed inside. During the day while practice sessions are ongoing, the Patriots Pro Shop, the Hall, the team’s Hall of Fame and the Fan Zone will all be open. There are concessions open behind the bleachers during practice. The Miami Dolphins were a busy lot on Saturday as they worked out a trio of cornerbacks and signed one of them, Rashaan Melvin, who spent a part of 2015 with the Patriots. The Fins need help at corner and Melvin played in eight games with the Pats a year ago. In a corresponding move, Miami released tight end Jake Stoneburner. Stoneburner played in 11 games with one start and caught five passes for 47 yards, for a 9.4 avg. and two touchdowns for the Dolphins in 2015. The also activated Bobby McCain from the Physically Unable to Perform List (PUP). A 5th Round Draft Pick (145th overall), in the 2015 NFL Draft, McCain played in all 16 games with four starts as a rookie for Miami in 2015. He recorded 22 tackles (19 solo) on defense and added six special teams stops (four solo). File this one under, let’s quit acting like children and admit we need one another. Jets QB Ryan Fitzpatrick signed a one-year $12 million dollar contract this week, fully guaranteed and with another $3 million in incentives. So hey, what kept ya? This one was a no-brainer from jump street, the two sides needed one another but neither would budge. But on the verge of training camp starting, the two sides finally struck a bargain. Fitzy had a solid year for the Jets a year ago and had them on the verge of a playoff spot. With the two sides far apart, the Jets tried to leverage Fitz by publicly declaring their confidence in Geno Smith. Which probably impressed no one other than Smith. Is Fitzpatrick a franchise QB? No. but he’s a helluva lot better QB than Smith and gives them a chance to play for a shot in the playoffs. The Buffalo Bills are hoping that getting more rest during training camp will help cut down on injuries and give the team a healthier outlook once the season begins. So head coach Rex Ryan instituted a 10 o’clock curfew this season. This entry was posted in Patriots Commentary, Patriots News and tagged 2015 NFL Season, 2016 NFL Combine, 2016 Patriots Roster, 53 Man Roster Projection, Bill Belichick, Julian Edelman, LaGarrette Blount, Malcolm Butler, Miami Dolphins, New England Patriots, New York Jets, NFL, Patriots, Pats, Rex Ryan, Rob Gronkowski, Tom Brady on July 31, 2016 by Steve Balestrieri.